1. Cut the pork into 2cm-thick slices. Place the slices between 2 sheets of clingfilm and bash with a rolling pin or meat mallet until they’re halved in thickness. Mix the chilli oil, cornflour and soy sauce together as a marinade in a shallow dish. Add the pork and turn to coat in the mixture, then cover and chill for 1 hour. 2. 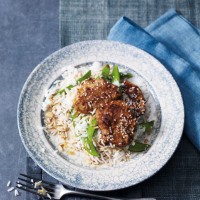 Cook the rice in boiling salted water for 10–12 minutes, adding the sugar snaps for the last 2 minutes of cooking time. 3. Heat the sunflower oil in a large frying pan. Remove the pork from the marinade and cook for 3–4 minutes each side, until golden and cooked through (you may have to do this in batches). Return all the cooked pork to the pan and stir in the chilli bean sauce with 100ml water. Simmer for 2 minutes, then remove from the heat and scatter over the sesame seeds. Drain the rice and sugar snaps then serve with the pork.